Bafana Bafana coach Stuart Baxter heaped praise on RC Strasbourg striker Lebo Mothiba by comparing him to Premier League all-time top scorer Alan Shearer. 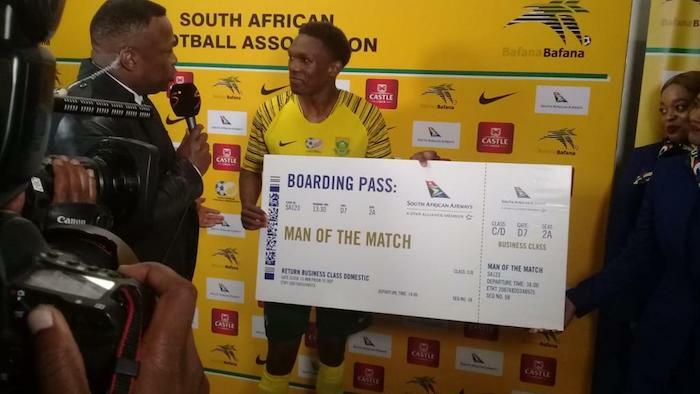 Mothiba justified his starting berth for Bafana by continuing his recent goal-scoring streak, netting the third goal as well as grabbing an assist in South Africa’s 6-0 thumping of Seychelles in their 2019 Afcon qualifier. Baxter also highlighted the role of assistant coach Shaun Bartlett in aiding the attacking players with pointers on how to finish. ‘Shaun had a conversation with all strikers in terms of their finishing, and when a top striker like Shaun gives you ideas and that helps,’ Baxter was quoted as saying by Safa.net. ‘Lebo Mothiba led the lines with his bullish play, the Alan Shearer-type of player. He bullied centre backs and had no moments of peace. I was pleased with Lebo, his general attitude and work rate,’ he concluded. Bafana will be hoping for more of the same when they face Seychelles at the Stade Linte on Tuesday, with the match scheduled to get under way at 3:30pm.